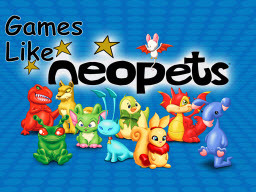 Games Like Neopets: Adopt Raise & Train Your Pets '+g+"
Neopets is a never ending online game where the players create and take care of their virtual pets called Neopets and explore the virtual world of Neopia. Players can earn Neopoints(NP) through various means like playing games and selling items, these earned neopoints can be used to buy various virtual goods and services. If you are a fan of virtual pet games like Neopets and looking for similar games then find the recommendations for it below and don't forget to mention if we miss any games as we keep on updating this list. Subeta is a fun community that allows players to adopt, raise and train a virtual pet as well as create a human avatar. Each pet has stats that can be raised through training and battling opponents in the Battle Coliseum. The pets can also learn new spells by reading books. Powerpets is a fun virtual pet site where you can adopt a pet, care for it, play with it. The main focus of Powerpets is educating and raising awareness of animals' rights. The game doesnt have any specific goals so the players can choose their your own goals like achieving elite status, purchasing lands, completing collections etc. Moshi Monsters is a fun online world created by Mind Candy, where you can adopt your own monster, go on adventures, play games, solve puzzles, be creative, and communicate with friends in a safe environment. The site have over 80 million registered users in 150 territories worldwide. Fantage,......if you can think of more, then don't forget to mention it in comments.